Be an NRI or be a Resident Indian, financial planning is a must. The basics of financial planning are the same but the plan has to be tweaked for different people depending on circumstances, goals and financial assets and liabilities. Similarly, financial planning for NRI has to take certain factors into considerations. After working with more than 15 years with NRI families – I can say Financial Planning Service for NRIs is a lot complex in comparison to resident Indian. It’s not about more money, more choices, more confusion but it’s multidimensional & very dynamic. Financial Planning is a process of developing strategies to help people manage their financial affairs to meet life goals. Build a corpus for your child’s education. It depends on the course, place of study whether India or abroad and how you want to finance it. For example, an engineering course in an NIT today costs between Rs. 5,00,000 to Rs. 8,00,000. You will have to factor in an inflation rate of 8-10%. Lot of NRIs want their kids to study abroad. A Masters degree in Australia can cost between Rs. 20,00,000 to Rs. 35,00,000 per year today depending on the specialization – in US & UK it will be more. The inflation rate there has been in the range of 2%-5% in the last five years. 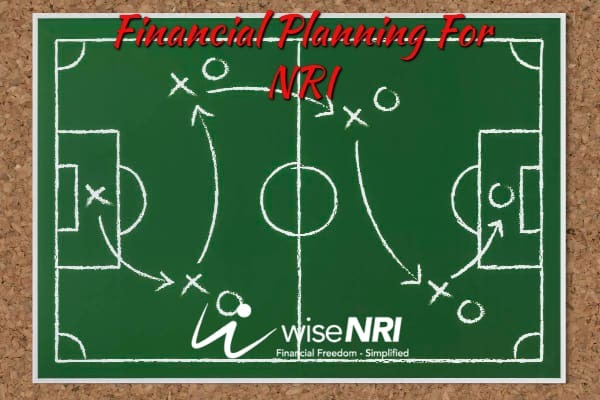 Just to share how complex things can get when it comes to financial planning for NRIs. NRI students in India also get a special quota in premium colleges in India but fees will be much higher – that number should be considered while preparing the plan. Inflation is 10% but what about currency depreciation if your investments are in FCNR or international investments? Will he be studying in the country where you are staying right now? Will he go to some other country? What will happen if you will retire before his college education? Should you invest in India for this goal or keep this money in foreign assets? If you are investing in India – inflation in educations cost should be considered 3% or 8%? How to handle currency depreciation or how that can impact this goal? 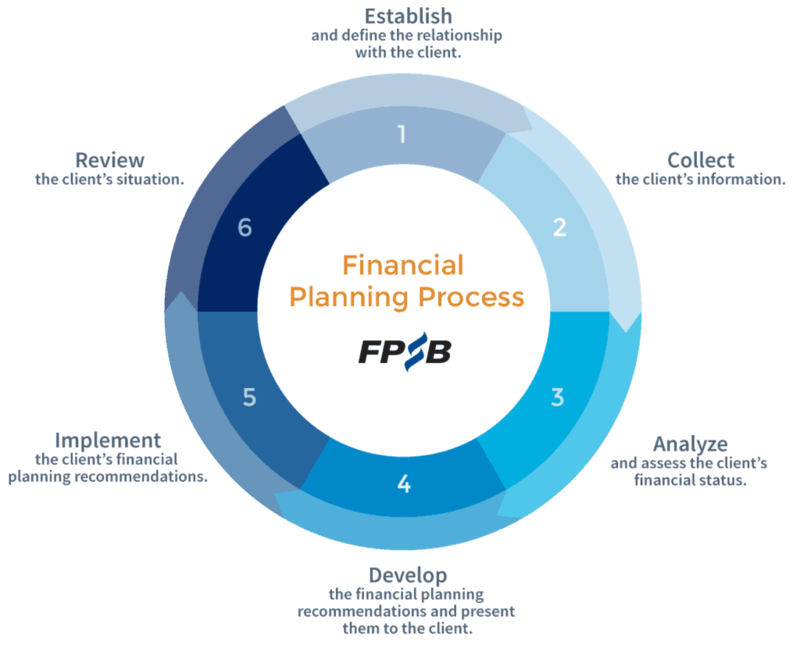 There are lot more questions that financial planner has to handle before making the financial plan. These complexities are not limited to child education – in every goal NRIs bring more dimensions. It is an important milestone for parents. You have to decide if you want to spend on it and how much you want to spend on it and accordingly plan for it. What if kids are foreign nationals or marrying to foreign nationals? Actually, above 3 are not goals but responsibilities & there are n number of other goals depending on individuals values & financial condition. 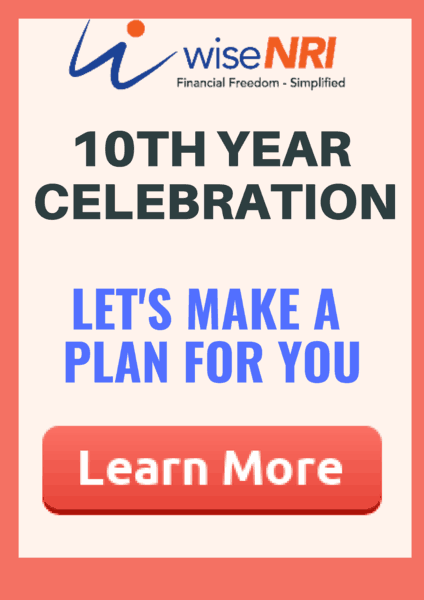 Financial Planner can explore that while building a financial plan for NRI. Many NRIs are underinvested. They are not sure of how to invest in India and are hesitant to invest fully in the country of residence. Many NRIs get dollar salaries but all the money lies in the savings/current account without earning much or even losing value after inflation. Other NRIs invest on the basis of emotions and put a lot of money in real estate in the place they were born or where they stayed in India when recommended by their relatives or friends. Some others invest in products that they are not eligible to invest in. FDs in NRE and NRO accounts – NRIs can transfer their earnings to FDs in NRE and NRO accounts and earn better interest rates. You know that NRI FD is tax-free in India but what about taxation in a country where you are living right now? If you are ready to take risks in the stock market, you can invest in shares for the long-term to earn returns. Investments in stock markets are risky especially direct stocks. Understand your risk capacity and risk tolerance and research and analyze the stocks that you want to buy or sell and then go ahead. The BSE Sensex (30 companies that constitute the index) has given returns substantial higher returns in comparison to other asset classes in long-term but with volatility. So there is a lot of potential in the stock market provided you invest smartly. NRIs can invest in real estate as prices have bottomed out in most places in India if they need a place to stay or want to bring in diversification to their portfolio. Investment is the Heart of Financial Planning. NRIs can invest in mutual funds as long as they follow rules and regulations prescribed by FEMA. Mutual funds are managed professionally and have the potential to give better returns than debt products. Mutual Funds invest in a variety of assets and securities and therefore provide ample diversification in your portfolio. Funds can be repatriated based on certain regulations. NRIs can invest in the National Pension Scheme (NPS). It is a retirement savings scheme. One can contribute at least Rs. 6000 per annum to the NPS account. The funds received from all subscribers will be invested in different securities like equity, corporate bonds, and government securities. There are different investment options based on one’s preferences and exit regulations based on the type of account. There are no restrictions on repatriation. Half of the NRIs are still continuing their normal savings account – it’s illegal. Investment through NRO or NRE? NRIs cannot make fresh investments in products such as PPF, certain PSU bonds, post office schemes etc. Check before investing if you satisfy the eligibility criteria. For most investments in India, it is important that one follows the KYC norms and details such as identity, address, income etc. needs to be provided along with documented proof. Over and above the financial planner has to make sure that NRIs map these investments with the goals. Just because you are an NRI, it is assumed you have enough money to take care of financial emergencies. You are sold ULIPs or Endowment plans in the guise that they provide insurance and give high returns. Bankers keep waiting for you in the airport lounge – just to achieve their targets. Insurance has to be taken based on risk management and current financial status. The right insurance product has to be bought so that financial emergencies can be managed appropriately. Insurance is a very important aspect of financial planning as it’s your plan B. 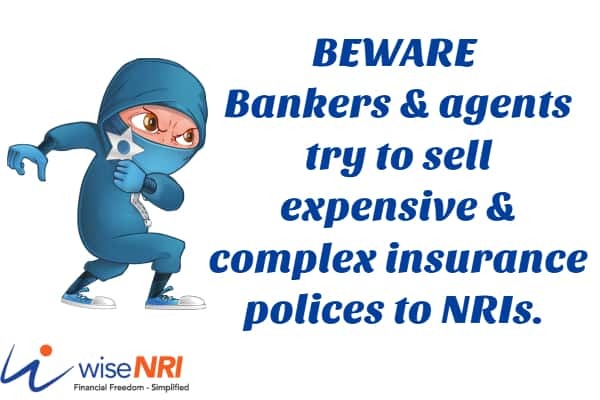 Other than misselling NRIs face regularly in India – I have seen in many middle east countries & even in other countries they are trapped for buying expensive life insurance policies by Zurich, Friends Prudential like companies. Buying term plan in India is not easy as you have to present for the medical test here – if NRI bought an international term plan, again his family will have to handle claim settlement in the unknown territory if the claim happens after coming back to India. What about premiums if NRI returns before premium paying term? Health insurance & accidental buying decisions should also be done after giving proper thought. All these things & hand holding is done by financial planners. It is difficult to predict the future considering changes that can happen in your career, family situation and economic and political situations in countries. But have a broad plan in mind as to where you will live about 5 years from now. Think about where you want to live post-retirement. Your retirement corpus depends on this decision. If you plan to live in a country different from India, think of visa and residence rules, investment options and retirement lifestyle. Is it right time to buy property in India? As an NRI, you have to plan your finances such that you get the most optimum returns and build a good corpus. You have to invest on the basis of where you and your family are going to live and where will you achieve your life goals. For example, if you are living in Singapore and your family is in India, then you will need to build a corpus such that your needs of staying abroad and your family’s needs while staying in India are catered to. The inflation rate is different in both countries. There will be trips between India and Singapore at least 2-3 times a year. In India, you will have to invest in products that are available only for NRIs. But your family members can invest in all products that resident Indians are allowed to invest in. Even though we do not like taxes, taxation is an important aspect of financial planning. You have to ensure your tax returns are filed properly as applicable in India and in the country of Residence. The income earned in India from rent, interest, the sale of investments are taxable. Pay your taxes as applicable and file your income tax returns. Take advantage of DTAA. Ensure your family members also pay tax and file returns as per their residency status and income. NRIs should also remember that there can be double taxation. Estate or succession planning is important so that the NRIs can ensure that their heirs get the wealth smoothly. NRIs’ wealth is across countries so it is important that the estate is planned such that the succession laws of both countries are followed and all assets are in the plan. To start with as an NRI, write one will that takes care of assets in India and one will that takes care of assets in the country of residence. NRIs who get assets in inheritance have to consider laws in India and their country of residence. 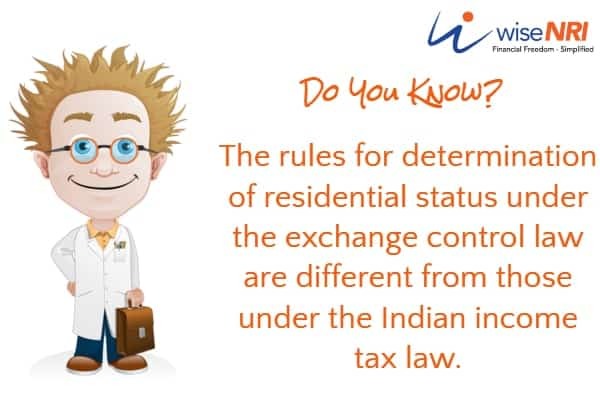 For example, if you are an NRI who gets a property which earns rent, you will have to pay taxes as applicable. If you are an NRI living in the US who gets assets in India that generate income, you are liable to pay tax in the US too. So if you pay tax in India, you will get a foreign tax credit (depending on DTAA) that will reduce your tax liability in the US. Most of the financial planners follow the standard 6 step process defined by FPSB but as Maruti 800 is different from Audi Q7 – the quality of advice can be different. 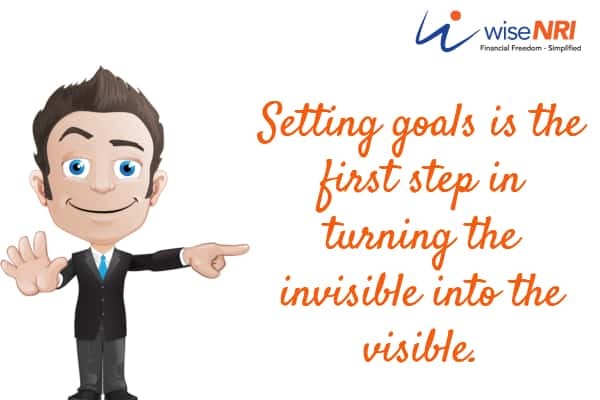 A competent financial planner creates a proper and unbiased financial plan to grow your wealth and earn optimum returns. As an NRI, select a financial planner who is well-versed with the financial markets, investments and tax laws in India. The other option is to choose a financial planner for India and another planner in the country you live in. The financial planner/ planners should be aware of taxation laws, residential status rules, investment eligibility, FEMA and DTAA. Choosing a SEBI Registered Investment Advisor who is also a certified financial planner can be a good start. But being an NRI you should also look at someone who is specialized of working with NRIs & can understand your requirement better. Your bank might provide you with some professionals that give you advice on investments but you might just end up buying products that are not suited to your needs but the bank’s needs. Financial Planning is important whether you return to India or not so that your hard-earned wealth is taken care of and it earns more money for you to meet your financial goals and provides for your comfortable retirement. If you have reached till the end of this post - I can safely assume you liked the post 🙂 Please share this with your friends or on social media & help us to spread this message. 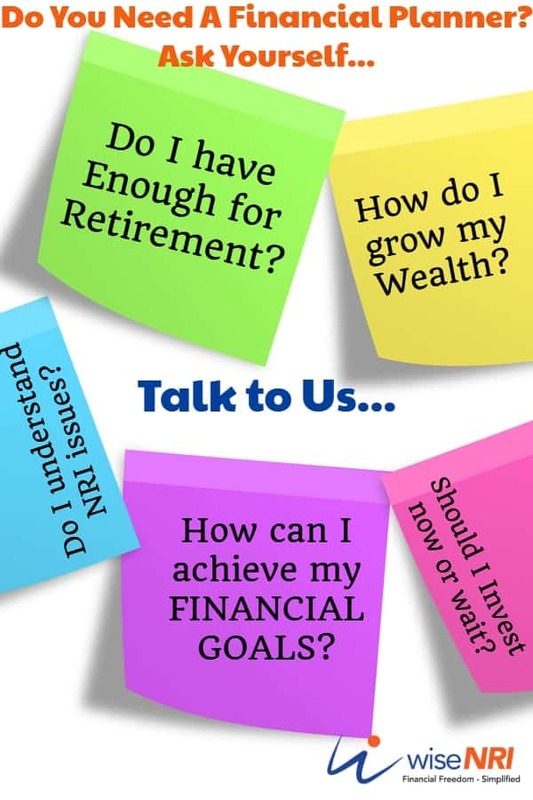 If you have any questions on Financial Planning for NRIs - feel free to add in the comment section. Note recent changes announced on NPS: no tax (EEE) on withdrawal at retirement, more equity contribution possible, etc. ARE NRIs get all these benefits? Please clarify. Yes, NRIs can avail all the benefits in NPS. P.s. NPS will make sense only if the investor is sure of coming to India after retirement, due to the restrictions on withdrawal. Can you share – what exactly you want to know..